For all of your vaccination concerns or questions, there’s Nightingale GLOBAL VAX Travel Clinic in Cobourg, a full-service travel health clinic. Whether you are backpacking into the jungle or touring Europe in high style, remember to get the proper vaccines at Nightingale GLOBAL VAX Travel Clinic in Cobourg. Visit Nightingale GLOBAL VAX Travel Clinic today to find the recommended vaccines to keep you safe while you volunteer abroad. Vaccines are essential for disease control and prevention. This is especially important when you travel as your body gets exposed to foreign disease-causing viruses and bacteria. By getting the proper vaccines for your age, your health needs, and your planned travel destination, you are building up your immunity against any possible threat to your health. Whether you want to book an appointment at our Cobourg clinic, or you need our mobile vaccine unit to come to you, Nightingale GLOBAL VAX Travel Clinic will help you receive the proper vaccines you need to stay healthy. We provide vaccination services to the communities of Cobourg, Peterborough, Northumberland, City of Kawartha Lakes, Haliburton, Durham Region and the Quinte area. 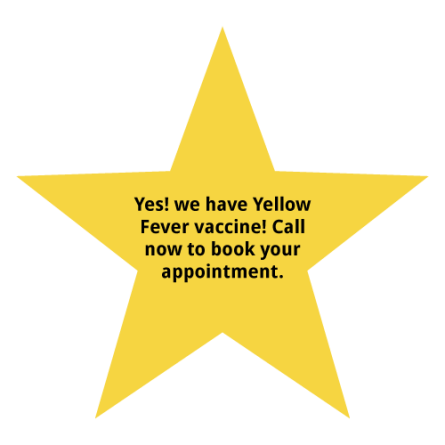 We are also a Health Canada designated Yellow Fever Centre. Nightingale GLOBAL VAX Travel Clinic is a part of the locally owned and operated Nightingale Nursing, which has been providing quality home health care, both nursing and personal support, and home maintenance for senior citizens since 1985. At Nightingale GLOBAL VAX Travel Clinic, our goal is to optimize safety and health for everyone, especially travellers. New experiences are an integral part of travelling, but sometimes those experiences include exposure to foreign viruses and bacteria that your body has not built immunity against. For your personalized pre-travel consultation at Nightingale GLOBAL VAX Travel Clinic, please book an appointment with us today! It’s recommended that you start planning your vaccines approximately six weeks in advance of your departure. Book an appointment to talk with one of our clinicians at Nightingale GLOBAL VAX Travel Clinic, or have us come to you. Our services and flexible schedule allow us to provide on-site consultation and vaccination clinics for large groups. Make sure that you and your loved ones are up-to-date with your vaccines. Protect yourself and your loved ones from preventable illnesses with the appropriate vaccines. Limit your exposure to disease-spreading organisms with our easy-to-use, effective travel products.